Tay Ninh (VNA) – Law enforcement representatives from Vietnamese and Cambodian localities sharing the borderline met in the first judicial conference in Vietnam’s southern province of Tay Ninh on August 29. The function was co-chaired by Minister of Justice Le Thanh Long and his Cambodian counterpart Ang Vong Vathana. Long said the function holds significant meaning in boosting bilateral judicial cooperation. He noted that under a memorandum of understanding (MoU) on law and justice collaboration signed by the two justice ministries in 2009, exchanges of high-ranking delegations and experts have taken place and agreements on civic justice support and extradition have been signed. Vietnam’s border provinces have also worked to spread legal knowledge, offer legal support, and settle disputes among their residents and Cambodians living nearby. The minister urged for deeper and more effective engagements in the coming time to meet the sides’ demand and potentials, which gained favour among 100 participants. The participants asked for the completion of internal administrative procedures for agreements on criminal justice support and on transfer of prisoners, which were signed in December last year, to soon take effect. 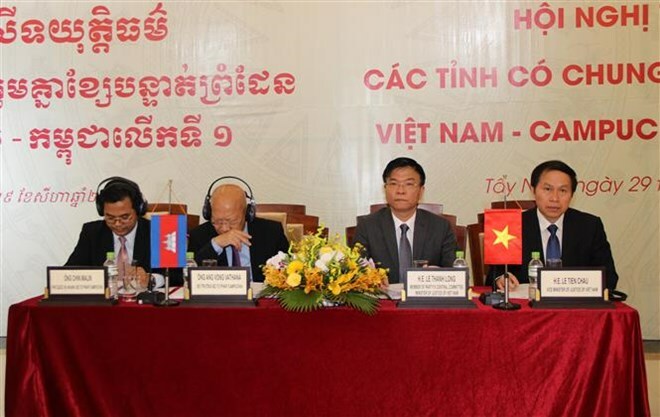 They recommended justice agencies in Vietnam – Cambodia border provinces to work together in sharing expertise and proposing legal – judicial collaboration subjects to be included in the MoU on cooperation between Vietnamese and Cambodian border localities. On the occasion, the Vietnamese and Cambodian ministries of justice inked their cooperation programme for 2017-2018. The justice academy under the Vietnam Ministry of Justice and its Cambodian partner also signed a memorandum of understanding for future joint projects.